Meet outside the Pniël Museum in River Street (off Main Road) Pniël. Main Road is also indicated as Hoofweg! This is off the Helshoogte road (R310) through the village and if you are coming from the Stellenbosch side it is on your right. Mathew Cyster will show use some of the historical sites in the village and give us a tour of the Museum. Please note that although we do not have to pay for the tour we should make a donation to the museum. As one walks / strolls through the rooms of the 17th century farmhouse of Papiere Molen – which is now the museum – one gets the sense of a humble but proud community that is at peace with itself. The professionally laid out photos, stories and artefacts keep the visitor enthralled, captivated, while time seems to take you back to 1843 when the first freed slaves came to start a new life here. The establishment of a mission station at Pniël is marginally connected to the emancipation of slaves in 1834. The emancipated slaves were obliged to stay on as farm workers for another 4 years, thus it was only from 1 December 1838 that they were allowed to leave the farms. With little or no money most of them continued to work for the farmers in the area, and returned to their homes at night. Pniël was established in 1843 by the Apostolic Union, a non-denominational protestant group, as a mission station for the freed slaves who worked on the surrounding farms. Reverend J.F. Stegman was appointed by the union as the first reverend of the mission station, his goal to teach and instruct the slaves in the Christian faith. Thus came into being the nearest mission station to Cape Town and one of the few remaining historical areas within a specific geographical boundary where the freed slaves built their houses and worked the lands. Land was donated by two land owners in the area, Pieter Izak de Villiers and Johannes Jacobus Haupt. Land was also donated by de Villiers and Piet Retief for establishing a church and a school. In December of 1843 they purchased a large farm area, Papiere Molen, where the slaves could build houses and farm. After more than a century of self-governance, the village now forms part of the Stellenbosch Municipality, 10 km away. 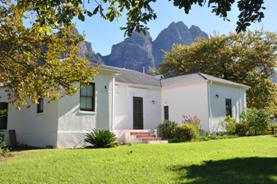 Franschhoek to the north and Paarl are also ±10 km away. The village is situated at the bosom of Simonsberg Mountain that watches over a history of slavery, but also of a people that struggled for freedom through hard work, faith and education. Today the narrow streets, beautiful oaks and old buildings are part of a heritage that never fails to captivate and enchant visitors to the village. The church is still housed in the original building. From here we will go on to Lekkerwijn which lies off the R45 Paarl to Franschhoek Road, just after the junction with the Helshoogte Road (R310), where we will look around the historic homestead before having our picnic lunch in the grounds Our host here is the current owner Simon Pickstone-Taylor. The original grant was made in 1690 to Henri L’Ecrivant (Colloquially known as Arie Lekkerwyn). Fransen suggests that Sybrand Vermeulen, who owned the farm in 1744, built a house that now probably forms part of the present house. 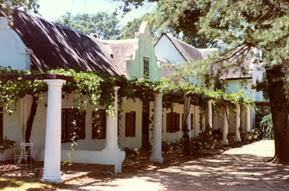 The front gable of the T-shaped house is dated 1834 and must have been added by Jacobus Stephanus de Villiers. Herbert Baker added the double-storey wing on in 1908 for Harry Pickstone who had bought the farm in 1900. NB: VASSA outings are for paid-up members only! Please wear your badge with paper slip in it!